I’ve been sitting on this post for about a month now, which is nobody’s fault other than my own. Our dinner at Pittsburgh’s Meat & Potatoes was pretty much my favorite meal on our recent trip, and yet, it’s the last to get mentioned on this blog. I started a new job a couple of weeks ago and I’ve been playing catch-up on the web, so before this glorious meal starts to fade in my memory (which on second thought, probably wouldn’t happen since it was darn good), let me tell you of a place you must try if you find yourself in the area. While searching for a place for dinner with the boyfriend and the pseudo-in-laws, I stumbled upon the website for M&P. Open for less than a year, the menu for this awesome gastropub made my mouth water. A stellar selection of craft beers, decent wine, and a cocktail list using fresh ingredients that could warrant the term “mixology” but without the “mixology” price tag? I’m in! But while the casual-hip atmosphere and well-curated libations are definitely reason enough to go here, the food stands out as innovative yet familiar; filling, well-executed, and affordable. Our table started the meal off with an order of their mussels cooked in a white wine sauce and served with fried taters (fries) with a black truffle aioli. These mussels were fresh and quite flavorful with the addition of smokey chorizo, chili, and broccolini– it’s broth soaking in great flavor and accentuated with a touch of cream. The boyfriend’s parentals ordered the salmon (pictured at the top of this post) and the roast chicken, respectively. 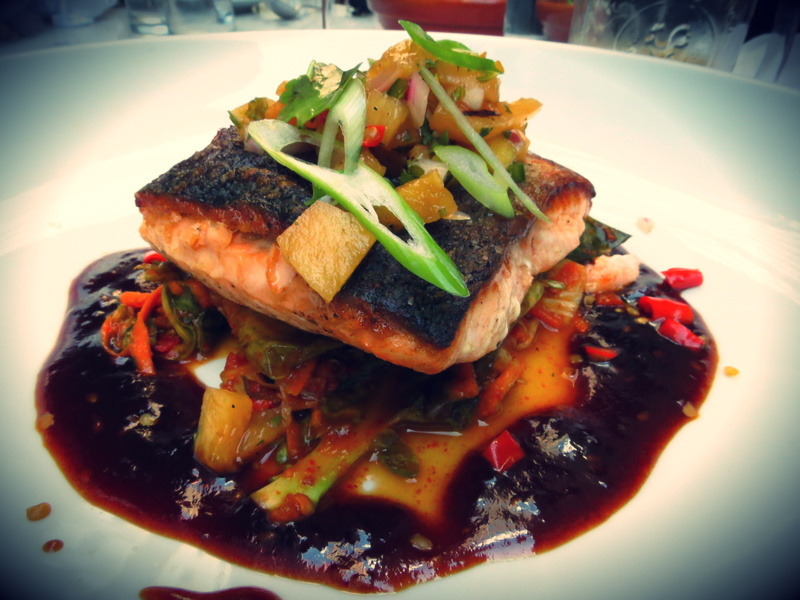 The salmon had a beautiful presentation and was exotic and packed some heat with its Brussels sprout kim chi, pineapple, chili, and Korean BBQ flavors. The Pan Roasted Chicken had more south of the border flavors with black beans, yucca fries, salsa verde, and queso fresco. Boyfriend went the route of their Hudson Valley Duck Breast which was cleverly crusted with pastrami seasonings and served with sauerkraut pierogies, ramp butter, dandelion greens, and chimichurri– we shared bites of this and I must say, that duck was served at a perfect medium-rare and had loads of flavor. For my entree, the Braised Lamb Shank. I surprised even myself when I made this my dinner of choice, but the description sounded too good to pass up (and it did not disappoint). A giant bone-in lamb shank was placed before me; perfectly fall-of-the-bone tender and covered in a glorious sauce and gremolata. This entree was served on a bed of creamy Tuscan white beans, broccolini, and a bitter braised kale that helped cut through the fatty, homey goodness of the lamb. If you can’t tell, I was an absolute fan of this dish. Completely stuffed from this rich and comforting dinner, we opted to skip dessert. But with Southern Tier’s Creme Brulee stout on the menu, the boy and I couldn’t resist. Do yourself a favor and head to Meat & Potatoes next time you’re in downtown Pittsburgh. Big thanks to the McDowells for a lovely time!